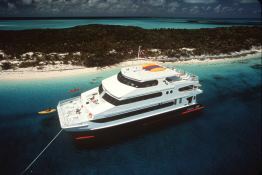 The new 102 ft catamaran, Aqua Cat, offers luxury accommodations, a spacious main salon and an extremely smooth ride. Her ability to cruise at a speed of 14-knots will get you to dive sites quickly while her 35-ft beam will ensure a smooth ride. 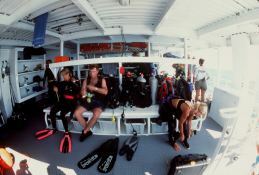 The eleven passenger cabins are some of the largest of any liveaboard in the world. This Power Cat 31M was built . 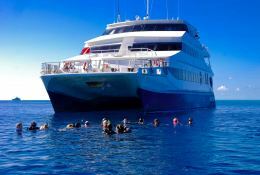 With its 11 crew members, she welcomes up to 22 passengers on board to explore Bahamas. This Power Cat 31M can reach a cruising speed of 14 knots thanks to its 2 powerful 60 hp engines. 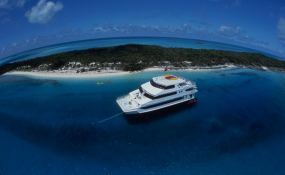 This 31M yacht available for charter in Bahamas is fully equipped with watermaker and also DVD for leisure. This motoryacht is available for yacht charter with a base price of 48 290 $ (approximatly 42 820 €).